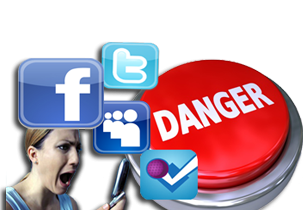 Social Media “Enslavement”…yep, you read that right! Walt Mueller is the Prez of the great organization, Center for Parent and Youth Understanding. I've quoted him before and I recommend his website and ministry highly! Walt has his finger on youth culture from a "theocentric" perspective…in other words, if your worldview is decisively influenced and informed by your faith in God, Walt's blog is for you! Anyway, this post appeared on Walt's website this week. I've editted it a bit to give you the gist of what he is saying. In addition, another pal of mine pointed out a video that "preaches" the potential downfall of social media. I know for me, these are the days that I'm seriously reflecting on how much time technology takes out of my life. My problem is that I have an insatiable curiosity that the internet and instant information exposes and feeds. What I find in my life is that my head is buzzing ALL THE TIME…and that's not good! So, read the info below…reflect on it…pray on it…and then ACT ON IT! Social Media Enslavement. . . What I'm Going To Do. . . and a Challenge. . .
As a regular part of our "No Parent Left Behind" seminar on youth culture, I pause and ask parents this question: "What concerns you most about today's youth culture?" It gives them a chance to talk in groups about the ways that youth culture has changed since they were going through adolescence themselves. I then ask someone from each group to verbalize a youth culture reality that causes concern. Last night the conversation among a group of wonderful and engaged parents in Boulder, Colorado was weighted heavily towards the emerging world of social media. . . not at all surprising since the overwhelming majority of today's technology and social media wasn't even present just a few short years ago. It certainly wasn't a part of my growing up experience. The good news is that parents realize that social media and technology are not at all benign in their influence. This stuff matters because it shapes us in powerful ways. And because it matters, we need to make a matter of deep thought, discussion, and attention. One young mom in last night's group raised her hand and asked this question: "So, is it ok that I don't put screens and smartphones in the hands of my young children?" I loved the question and I wish that more young parents would ask it. I believe she knew the answer already. But because she knew her best judgment would put both her and her kids at odds with the majority of their peers, she simply needed some affirmation. These are the kinds of questions we always need to be asking. When media critic Marshall McCluhan stated that "first we shape our tools and then our tools shape us," he was sounding a warning that continues to fall on deaf. . . or maybe distracted. . . ears. This morning's Wall Street Journal included an interesting piece on summer camps that require campers to unplug and take a kind of technology sabbath. That's good stuff. In recent weeks, I've seen a growing number of researchers and commentators suggesting that parents are spending too much time engaged with their screens and social media, all at the expense of focusing on what really matters. . . their kids. Not only are they ignoring their kids, but they're teaching their kids to grow up and do the same to their children. On a personal level, I've been thinking about this quite a bit lately. I have a smart phone. I have a tablet. I have a computer. And there are times when I should be engaged with other people and other things that I'm far too engaged with my electronic screens. And while I might possibly be doing something valuable and beneficial, I'm also letting things that are usually more important slip. . . like engaging with other people and other things. So. . . I've decided to lay out some rules. Initially, I thought they'd be great rules to pass on to parents, teachers, and teenagers themselves. Reality is, I can't pass them on unless I'm already gripping them tightly in my own hands. Here are the rules I'm going to enlist in my own life. I want to invite you to try them out as well. . . for a week maybe. . . and then let me know if you've seen any benefits. 1. Don't engage with your smartphone as long as you are present with and/or in conversation with real flesh and blood human beings. They deserve your full attention. 2. Don't bring your smartphone or screen of any kind to the table. Converse with others over the meal. . . using your eyes, your voice, your ears, and your full attention. 3. Don't sleep with your smartphone on or near your bed. Sleep. Rest. You need it. When you wake up, the world will still be there and you can tend to your business. And if by some chance the world is no longer there when you wake up. . . well, you won't need your phone anyway! 4. Make your family room a no-smartphone zone. When you come in the door to your house, put your phone down. Then, go to the room where your family gathers without that electronic distraction. Put that phone out of sight, and pretty soon it will be out of mind. 5. Don't engage with your phone while you're driving. You'll be doing your passengers and everyone else on the road a huge favor. 6. Take a social media Sabbath. God created us for a rhythm of work and rest. Take one day. . . Sunday maybe? . . and power down. No posts. No comments. No replies. Sure, you can carry your phone with you in order to stay in touch with and be available to family. But forget walk away from all that other smartphone stuff.